Breville is one of the most popular brands when it comes to kitchen equipment and has always stuck to high standards when it comes to producing quality products. 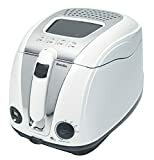 The Breville Easy Clean Deep Fryer is no different (VIEW PRICE HERE! 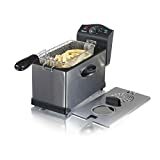 ), and this new fryer has set new standards for all other deep fryers to follow thanks to its compact design and many features it provides its users. Breville wanted to create a different deep fryer to its competitor, something that looked modern and still did the same job any other decent fryer would do – and they’ve got it spot on with this fryer. 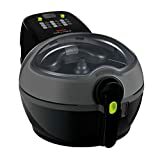 Choosing a deep fryer for your needs is pretty tricky because many of them do what they are supposed to, but this Breville product offers a bit more in terms of features and ease of use. The Breville Easy Clean Deep Fryers prides itself on safety and ease of use, and with their different components it’s very easy to see why this is called the “easy clean” fryer. 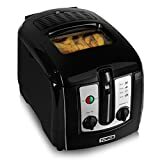 Digital timer and alerts – This fryer is perfect for those who like to do other duties whilst cooking, you can go and do a bit of ironing in the other room or even if you have some TV to catch up on a simple alarm will go off to notify you when your food is ready. Basket drainer – The rise and fall basket this fryer includes on purchase will allow excess oil to drain out easily, giving you cleaner tasting food once cooked. Hooking the basket above the oil after cooked for a minute or two can greatly decrease the amount of oil that is consumed. Temperature control – A simple temperature control knob will ensure your food gets served at the perfect time to suit its needs. You can fry food at a lower temperature and cook it for longer if you want to fry food such as chicken and fish, or you can speed up the cooking process by increasing it if wanting to fry food such as chips. Multiple indicators – There are indicators on the fryer that will determine when the oil is hot enough to cook in, the indicator will be lit if the oil is too cool, and it will turn off when it is ready for food to be fried. 2 Litre oil capacity – The big bowl will allow you to pour up to 2 litres of oil into it at any one time, which will allow you to fill your basket up with 1kg of food – this is perfect if wanting to cook multiple meals as it will save you putting another load of food in. Easy to serve food – Once your food is golden and crispy a simple flick on a button will lift up the lid, where you’ll be able to pick up your basket of food and serve. Draining the basket for a couple of minutes first will ensure your food tastes even better. Permanent filter – You’ll not need to worry about changing the filter on this fryer as this one is permanent and drastically reduces odour and steam – you can simply wash it with all the other components once you are finished with it and you will be able to use it again as normal. Non-stick bowl – The bowl used to fill the oil in will not only have oil in but also bits of food that have escaped the basket, which usually gets stuck to the bowl and is very hard to clean, but this bowl is non-stick so you won’t ever have that problem. Cool touch handles – You can guarantee a safe cooking experience with this fryer without getting burnt thanks to its innovative cool touch handles which will always stay cool no matter how hot the fryer gets during cooking practises. This is especially handy once all the food is cooked and you are looking to serve it whilst it’s still boiling hot. Small cooking window – If you are one of those that likes to check on their food every couple of minutes, you will be saved the hassle of keep opening up the lid with the handy little window that allows you to see what’s going on inside. This is great because it not only stops heat from escaping but it will also prevent oil spits keeping you safe in the process. The Breville Easy Clean Deep Fryer is one of the most popular choices around and should definitely be considered for your next deep fryer. There isn’t a lot this fryer can’t do and for the price you are paying when compared with other fryers is next to nothing.